Gknowmix is knowledge management company underpinned by genetic research translated into clinically useful applications. The service offering is governed by a Board of Directors, general manager of the database tool and a group of Scientific and Medical Advisors. In addition, based on their experience in the field, a multi-disciplinary consultancy team has been appointed to educate healthcare practitioners and the public in the application of genetic testing in clinical practice.Insight gained from extensive studies in the field of cardiovascular genetics has led to the development of a new test concept for multi-factorial diseases. This invention patented by the South African Medical Research Council in 2001, now serves as a prototype for development of new products and services using a similar pathology supported genetic testing approach. Healthcare practitioners, medical scientists and genetic/pathology laboratories participate in the Gknowmix genetic testing service delivery process. The Genetic Care Centre provides support to a network of healthcare practitioners who incorporated Pathology-Supported Genetic Testing in clinical practice. 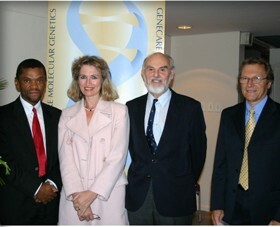 From left to right: Prof Anthony Mbewu, Prof Maritha Kotze, Prof Peter Beighton and Dr Tony Bunn. Maritha was awarded an Innovation Fund Award in 2005 for an invention patented by the South African Medical Research Council in 2001.